I was getting excited on social media a week ago because of our much anticipated return trip to Sundown Adventureland. We’ve been waiting for Ted to be potty trained and last week he finally cracked it. Then David threw in a curve ball. Why don’t we go somewhere new instead? Why don’t we go to Gulliver’s Lost World Theme Park and resort? We could stay in a dinosaur themed cabin, for a discount price. Dinosaur cabin? The available accommodation at Gulliver’s Resort sold it to me. So where can we go for the Gulliver fun resort experience? Milton Keynes of course! There are pluses and minuses to getting a bargain midweek deal to a family resort. On the plus side it was quiet, we’re not really massive fans of busy. On the minus side, it was too quiet. We were the only family in the whole resort. All the other guests were travelling on their own for work and had booked the cheapest accommodation available near Milton Keynes. This also meant that the evening entertainment wasn’t running, possibly a blessing in disguise. One major bonus was that we were given a free upgrade from our teeny tiny Dino Den to the super spacious (and on the website for three times the price) Lost World Cabin. A single room to a three bedroom, two bathroom cabin was quite the upgrade and much appreciated. We didn’t have a kitchen with our original booking so we hadn’t bought anything but the basics with us to eat. However, the onsite restaurants were only serving between 7.30pm and 8pm, far to late for the kids who were already getting hangry. This cabin had a fully equipped kitchen so I had a trip Morrisons. We were able to have a stroll around the resort and check out the other types of accommodation available. Next to our mega cabin was the Wild West Ranch featuring Prospector’s Deluxe Cabins (which look very fancy) and Wild West Cabins (which look tiny). Beyond the Wild West Ranch was the campsite. In the other direction was a large area of Jungle Safari Tents which offer spacious family accommodation. 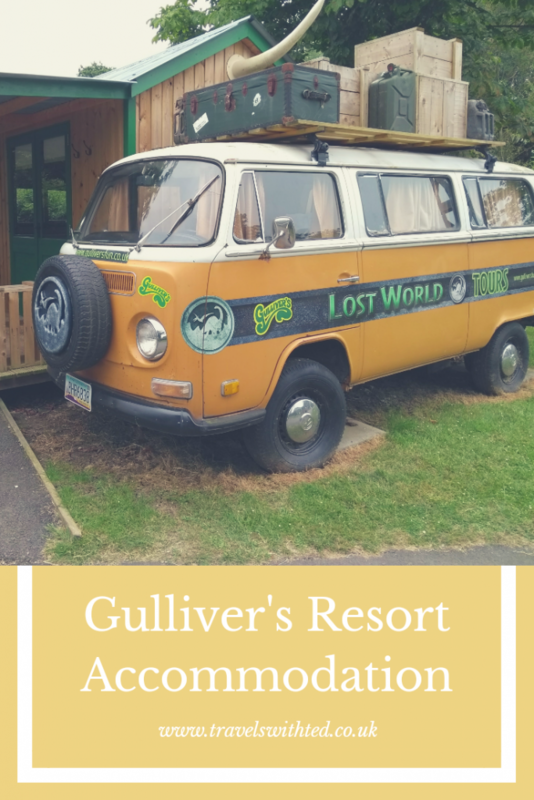 This adventurers’ village had the most traditional resort feel of all the accommodation at Gulliver’s Resort Milton Keynes. 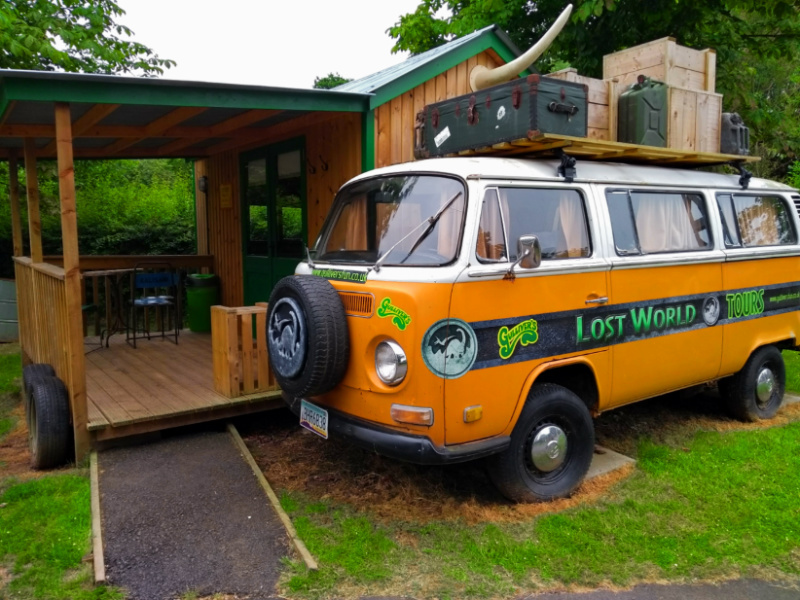 In the Lost World Lodgings area there was also a mid-range Dino Den Deluxe cabin which was cool because the bunk beds were in a VW camper, complete with driving seat. I think our bijou Dino Den would have been absolutely fine for one night. It was plenty warm enough for us to sit outside once we put the kids to bed so we could have coped with the cramped conditions. I wouldn’t have fancied it for a rainy week though. Our Cabin was ideal for a long stay, if a bit pricey. My only criticism was that for a family resort the accommodation wasn’t particularly set up for children. There was no travel cot or highchair available. There were several decorative and highly breakable pieces within reach of the baby. I don’t expect it everywhere but at a family place small touches like a highchair and plastic plates and cups for the kids are easy to do and much appreciated. The lack of entertainment was a shame but I could see why there was none on, it would have been awkward to have been the only family in the audience. More disappointing was the lack of food options. There was absolutely nothing available for kids on the night we were there. 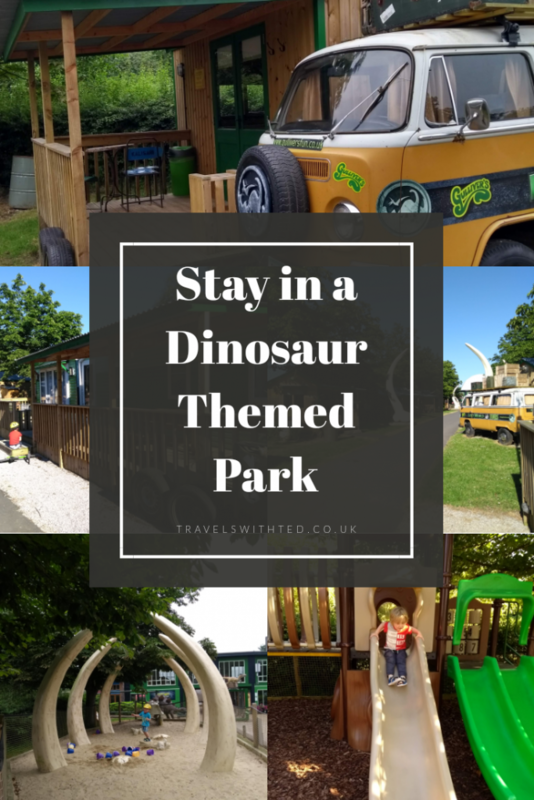 Ted liked the play areas, having space to ride his bike and spying the dinosaurs over the fence (from the top of the climbing frame you could see the Diplodocus). Ted did not like actually riding his bike, going to bed when he was asked to and leaving. May liked moving around ornaments, throwing herself of the veranda and the sand pit. May did not like sleep but that’s not the fault of Gulliver’s, she just doesn’t sleep at the moment. When David proposed the trip he did initially suggest we set ourselves the challenge of keeping the cost under £100. It was tempting, full trip for a family of four including 1 night accommodation and entertainment would make a good blog post and save us a few pennies. When we thought it through we realised that after accommodation and theme park entry we would have £10 left for food. We could probably achieve that with optimum frugality or we could spend that on car snacks. We booked a Dino Den in the Lost World Lodgings section of the resort for £59 on a Wednesday night. The Cabin we ended up with would have cost over £200 for the night. 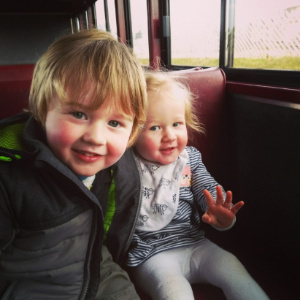 There are two theme park options at the Milton Keynes site. We knew we would only have time for one so we opted for the Dinosaur and Farm Park over the main Gulliver’s Land Theme Park. Tickets were £9.95 each for us and Ted. May was free. We saved some money by cooking for ourselves instead of locating a takeaway. I also bought stuff to make sandwiches for the kids for the following day. All the overspend went on luxuries (aka necessities, depending on how you look at it). We had a bottle of Prosecco on our veranda and we bought car snacks for ourselves as well as the necessary ones for the kids. It was also really important we had an ice-cream once the sun came out (money was saved by having it while May having a nap). 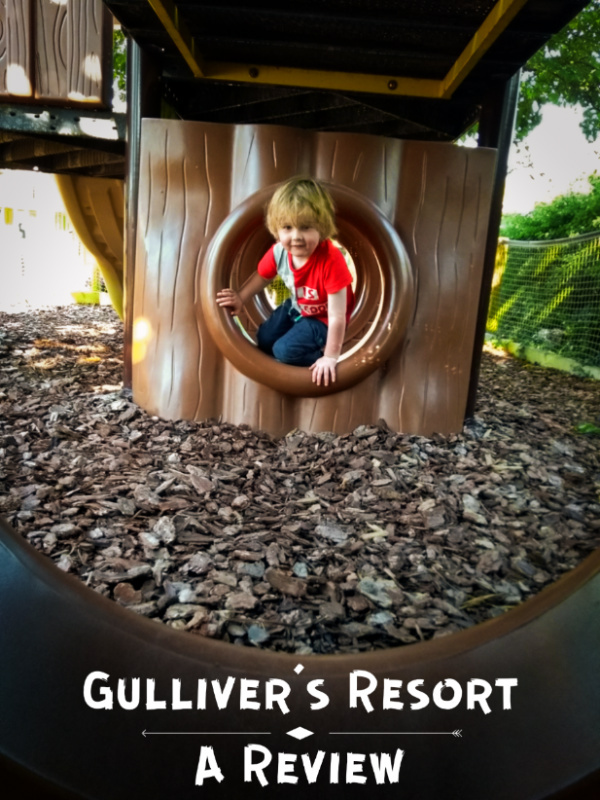 A post on the Dinosaur Park at Gulliver’s will follow. In the meantime, read about some of the best dinosaur parks here. Do you have any recommendations for interesting accommodation for kids? This post may contain affiliate links. If you use them we get a small commission which helps us continue to run this blog. All recommended products and brands are ones we use.